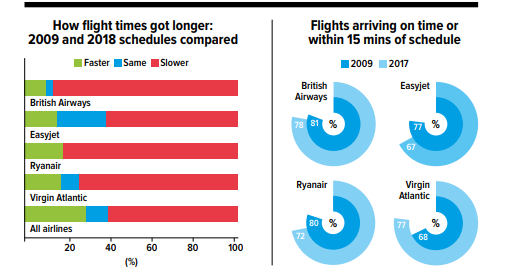 Scheduled flight times are up to 35 minutes slower this summer than 10 years ago, a Which? Travel investigation has revealed. Despite advances in air travel, 76 out of the 125 flights we analysed take longer now than in 2008 – if flight timetables are to be believed. But are planes genuinely flying slower or are airlines giving themselves extra time to reach their destination? If the latter is true, it could explain why pilots often manage to ‘make up the time in the air’ – even when they are subject to lengthy delays before take-off. 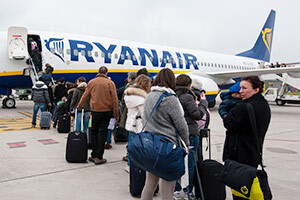 In fact, nine out of 11 Ryanair routes we looked at are slower in 2018, according to data from aviation analysts OAG. Even the budget airline’s short hop from London Stansted to Berlin Schonefeld has extended by 10 minutes, on average. The same was true of BA flights from London Gatwick to JFK, as well as London Heathrow to Bangkok and Singapore routes. These are all scheduled to take 20 minutes longer this year, on average. Of the Virgin Atlantic flights we analysed, nine out of 12 were also lengthier. The biggest time lag was on Virgin’s London Heathrow to Newark Liberty International route, which was a leisurely 35 minutes slower. Additionally, 16 out of 26 Easyjet flights were slower – its London Gatwick to Berlin Schonefeld service longer by 19 minutes. Want to know the best and worst airlines? Find out how passengers rated their experiences in our annual airline survey. Air travel has come a long way. Earlier this year the new Dreamliner set a subsonic speed record when it flew from New York to London in five hours and 13 minutes. So why would Easyjet need an extra 19 minutes to get to Berlin? 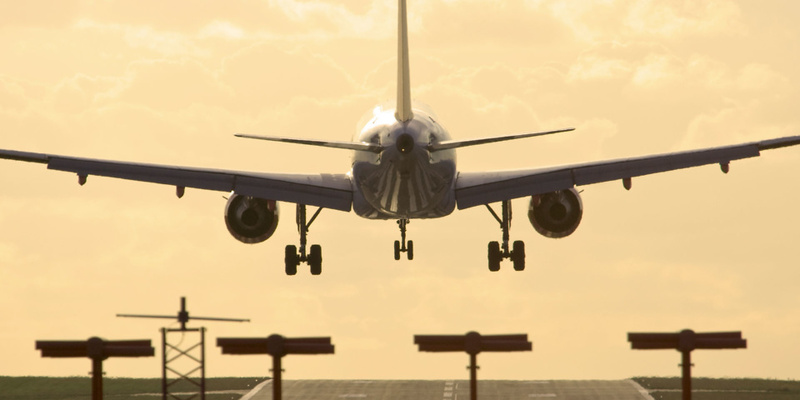 Keith Mason, professor of air transport management at Cranfield University, told us that airlines regularly ‘tinker’ with scheduled flight times to give themselves some ‘wiggle room’. ‘The problem for airlines is that if there’s any delay, then the knock-on effect through the rest of the flying programme that day is affected,’ he explained. This phenomenon is known as schedule padding. One of the benefits is that it also allows airlines to improve their punctuality records. Last year, Hong Kong Airlines was congratulated after it soared to the top of global rankings with 94.8% of flights classed as on time – ie touching down within 15 minutes of their scheduled arrival. Not that schedule padding seems to have helped Europe’s largest carriers arrive on time. BA, Easyjet and Ryanair were all less punctual last year than in 2009, with Easyjet recording a 10% fall in punctuality, according to the Civil Aviation Authority. Only Virgin Atlantic bucked the trend with a 9% rise. Find out which airlines are the least punctual according to the latest figures. There are some good reasons for longer flight times. British Airways pointed out that routes to and from the Far East had been adjusted for security reasons, including the Malaysia Airlines plane shot down over Ukraine in 2014. BA also told us that air traffic control congestion was a factor. With European skies now much busier than 10 years ago, it said previous flight taxi times had been ‘too optimistic’. Although, ‘an extra five minutes’ doesn’t explain why 20% of flights we analysed across the board have increased by 10 minutes or more. BA, Ryanair and Virgin Atlantic all told us that they were flying aircraft at slower speeds to reduce fuel consumption. Ryanair suggested this efficiency allowed it to lower costs and that this was reflected in its cheap £12.99 London to Berlin fare. Ryanair went on to explain that schedules were ‘adjusted up or down at the end of each season to reflect the average flight times recorded’. That means the poorer an airline performs, the more time it can allocate itself the following year – which could also help reduce the number of instances when it has to pay you compensation for a flight delay. After all, an airline is less likely to be late if they allow themselves more time to get there in the first place. Use our guide to flight delays and compensation to find out if you’re entitled to a payout and how to claim.